Hey everyone. I'll be making one last edit to this piece before I'm done with it. I want to thank everyone who gave me legitimate critique and made a real effort to help improve the piece. There were a lot of things I guess I just didn't see when it was first created. Thanks for putting up with my frustration at it, and your continued advice. I'll make a note when the final update is made. It won't be perfect, but I've gotta call it quits eventually. So much to love here. Your details are great, and I am very partial to squigglies in general, so that's a big plus for me. This brings me back to my Redwall reading days, both in subject matter (ofc) and more in the generally whimsical tone. It actually is, but it's because people have been expecting the perfect pieces out of you lately. Other talented people get even harsher criticism on minor details, sometimes. Btw, I disagree that you should completely drop the fox-man theme if you feel like there's more to do with it. Yet there's good in trying different subjects. will there be a wip thread? don't be shy! Next one is a sci-fi western piece in a tall canvas that's going to put a bunch of emphasis on environment. two of the characters are human, but I'm including an alien thing as the third because I can. Good enough? Keep in mind that most of the stuff I draw that's of this kind of subject matter starts as a doodle in a classroom. I'm not thinking it out, I'm just wasting time. "Also, it'd be nice to see you explore some other subject matter rather than personified animals. It feels like an artistic shortcut to avoid learning anatomy." I really feel Big Brother has got this right. Your pixelling skills are strong, Kaiseto, but I think you lack mastery in anatomy and layout. It seems to run consistently as a problem through your many excellently pixelled works. I'd urge you to drop the wolves/foxes and really do some practice work on people and environments! Time for the next big step! Omnomnom, this is really slick, it reads very well. I feel as though the right foot and arm/hand/sword are a bit small in comparison to the left, even taking into account that they're further behind... However the beauty of the piece really makes it hard to notice the small issues. The perspective makes much more sense now. I see the creature more from the side with a high zoom this time as opposed to the first one. Oh hot damn, this is awesome. I absolutely love the palette and the lighting. your foreshortening should be more extreme if you want it to be convincing, right now it's a figure in regular space with warped anatomy. a photographic reference would help greatly. if you want to salvage this piece without a bunch of repixelling, you'll have to tame the pose. near arm is still short, I just ignored the shape of the hand thing and pretended the forearm was behind it. if you want to fix the foreshortening, you'll have to bite the bullet and repixel much/most of this. i'd sketch it out first. 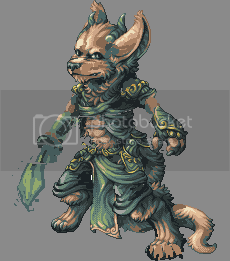 next time, make a thread at pixelation so you get help during the creative process, and not afterwards, when you no longer feel like working on/changing the piece. I think people misinterpret how long the middle portion of the leg is supposed to be. You've edited the foot to attach much further back, when generally on a digitigrade leg structure the middle section is by far the shortest. I can't entirely agree with that part of the edit. I see what you're doing with the arms, and it makes sense, but it basically skirts around what I want to do. I was attempting to practice some perspective. By moving both arms out like that it's flattening the character out, fixing the issue of bad perspective by getting rid of it entirely. -Where is the right hand? Is one hand just supposed to be a sword directly attached to his forearm? -His head doesn't match the action line of the pose. Think about the shape in 3D space. The angle of the eyes and ears imply that his head is turning upwards, yet the nose and mouth are squarely level with the "horizon." -Minus points for "tude" expression. Also, it'd be nice to see you explore some other subject matter rather than personified animals. It feels like an artistic shortcut to avoid learning anatomy. The shortness is, once again, my attempt at foreshortening. The character is supposed to be angled away from the viewer. Apparently it never comes off right, but I've got no excuse not to try. Anatomy has a few problems but you can see them I suppose: left arm is short, right leg is short, right hand is small, right ear is too far at back, etc. Yet this is totally unimportant for me. Your pixelling technique is top quality, and very close to fool. But your use of colors are not nearly there. (yes it's fool's most powerful side) you use too many colors of the same hue, and don't use contrast colors at all. Yes, I'm nitpicking and I gave 7 out of my 7 rating, but if your goal is there, you probably have to choose your colors more courageous. + I love your tasteful outlines. awfully misshapen. sorry but this looks like a child has drawn it. Great pixels though. I think his snout looks a bit flat. i knew this was a new Kaiseto peice as soon as i saw the preview pic on the main page! maybe it was the humaniod dog like warrior, i love it! great work as always! the brown goes so nicely with the greens, and the blues influence goes almost unnoticed but a powerful touch. only crit i could say is the left eye (our left) looks too far forward giving the face a flatter apearance or maybe its the check bone giving this effect, anyways its so minor and really all i could find! great work! The proportions and anatomy bother me. The head is rather large and the torso seems elongated and is bending in an odd fashion. Very good! But as Manupix mentioned, the thick line under the feet really bothers me. First thought when I saw the DP : " is that Fool's art?" It def has it's own style to it but a very awesome piece! Go hit the moon and then destroy it good sir! This is just amazing. You will reach your goal when you give yourself the freedom of choice of subject matter. Nitpick: I don't like the thick underside of the feet.